So I've been procrastinating on writing up my race recap for the 2015 Chicago Marathon because I've been in a bit of a funk with the post-marathon blues. Many runners get a little antsy in the taper phase, but I find recovery is even worse. Taking time off from running gives me more time to over-analyze my race performance and find ways to criticize myself despite having achieved my goal of sub 3;50. Ugh! I pretty much lost all confidence in my ability to ever BQ again after running my slowest of 3 Boston Marathons in April (4:08, previously ran 3:53 in 2013 and 3:53 in 2014), And when the news came out that entry into the 2016 Boston Marathon required a -2:28 BQ, I really started to panic. I had been hoping that a 3:53 would be good enough to get into 2017. Since I've run that time or better three times since 2013, I thought I could probably do it again, but trying to run in the 3:40s seemed daunting. However, once I accepted that the only way to BQ without extreme squeaker anxiety for the next year was to get a -5 minute time, I decided it was sub 3:50 or BUST! He told me that my last long run should be 12 miles at marathon pace and if I couldn't do that then I needed to come back and talk to him and re-evaluate my goal. The next day I ran 12 miles at 8:15 pace and felt more capable of achieving the 3:50 time. Since September I had been obsessively putting my race times into race prediction calculators to see if I could still run a decent marathon and also comparing my performances in the same races the other years I ran Chicago (2011, 2012, and 2013). My Women's Four Miler time 5 weeks before the marathon predicted a 3:33 in the Runner's Ally app (yeah right! ), but my Pepsi 10K time 3 weeks beforehand predicted a range of 3:42 - 3:51 based on my coach's chart. When I met with my coach the second time I questioned whether I wasn't being aggressive enough with my goal, but he pointed out that even though I did have a couple decent races this summer, I also had some bad ones so it seemed right to go out with a conservative goal and if the weather was ok, maybe I'd surprise myself and run faster in the second half. I've only run a negative split once in my life - my 2nd marathon when I finished in 3:54 and ran the first half in about 2 hours. I really wanted to get as close to a negative split as possible in Chicago. I knew the only way to do this was to go out with the 3:50 pace group. I've had problems with my Garmin in Chicago before, and this year it was no different. "I’m not sure where the “time in the bank” theory came from, but the strategy has lead to the demise of more marathon runners than any other source." Since I definitely didn't go out too fast for the first 6 miles, I decided to listen to all those friends who told me "run by feel" and I hoped for the best as I ran without the aid of the pace group. I looked down at my watch a few times over the next couple miles and saw my overall pace go down by about 5 seconds per mile and thought, uh oh. I tried to keep it more consistent and knew that once I saw my half split I'd be able to better gauge how things were going. I hit the 1/2 way point just under 1:54 which is the slowest I have run the first half of my 3 Chicago Marathons and 3 Boston Marathons since 2011. However, I also knew this was a minute too fast for my 3:50 goal and worried that I would be slowing down in the second half, but hoped I wouldn't hit the wall. I still felt pretty good through mile 18, but soon after that the sun and heat started getting to me. I couldn't bear another cup of Gatorade so I switched to water. I kept checking my fingers to see if they were puffing up, but I seemed to be handling the switch ok. I struggled with opening and eating the Clif Blocks and Gels, but I knew I had to consume some calories along the course. Once I hit mile 20 I noticed my overall pace was slowing down and I tried my best to keep it from creeping up more than 1 second every mile. I knew the 3:50 pace group would be coming for me and I was trying my best to not let them pass me until there were less than 2 miles to go. And that's about when I saw the 3:50 flag that I started the marathon with. It looked like there was only once other woman with him. I talked with the pacer at the expo a couple days before so I knew he planned on finishing the race around 3:49;47. I figured that even if he was ahead of me, as long as I could see him I would still be able to achieve my goal. At mile 25 started thinking about how I was going to explain on social media and to my friends how I let everything slip away in the final mile of this race. I already started to accept that I wasn't going to get get sub 3:50, and rationalized that maybe 3:51 or 3:52 wouldn't be so bad. I still had a shot of getting into 2017 with a -3 minute time. I was thrilled to see the 1 mile to go sign and 800M to go signs, but somewhere before the 400M sign I had an intense wave of nausea which has never happened to me before. I started to panic, thinking OMG it' s ALL OVER with the equivalent of a lap to go! NOOOO!!!!! I was seriously worried that I might not even finish. I think I briefly stopped and dry-heaved a couple times and then realized I just had to push through it and puke once I got to the finish line. I remember wanting something to hurt so I could push through the pain and just get this damn thing over with. I'm not sure how, but somehow I made it... I crossed the finish line! And then I went to the side and threw up. Well,, I tried, but not much came out. And almost immediately a volunteer came to help me and make sure I was ok. I kept apologizing to her and she said it was ok, I just ran a marathon and I could lean on her. I walked with her a bit and stopped a couple more times to try throwing up. Then we saw some guy about to fall over and I told her go take care of him, because I was fine. So what cost more? Two nights in a Chicago hotel during marathon weekend or the Lice Doctors? Yeah, that was a tie. YIKES! 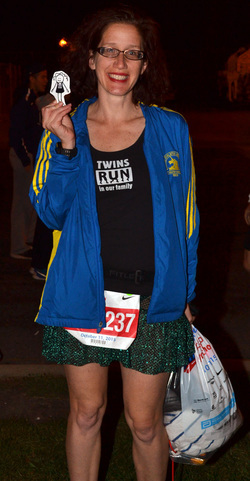 I was so excited to get my photo taken with Deena Kastor holding my Flat Twin on Saturday morning. I had met her before in Boston 2014, but I had forgotten how small she is! I'm pretty sure my calf is bigger than her thigh. I couldn't help myself but say, "You're so tiny!" And she replied, "Don't let that fool you! I'm fierce!" I wished her luck with her race on Sunday. She's soooo amazing! Every time I looked at the blue line on the course (and I was on top of that line from about mile 3 on), I kept thinking Deena just ran these streets and I'm so lucky to be following in her footsteps. There's only one post-race photo of me which shows you just how sick I was feeling that I didn't even stop for congratulatory photos. On the other hand, I got like 5 pre-race pictures! I loved splurging on a ticket to the Balboa Hospitality Tent. I was the first person to use one of the portapotties and never had to wait in line before or after the race. The post-race massage was heavenly and even though I had absolutely no appetite after the race, there was great food. I had the best time taking an architectural boat tour after the race, although it might have been a good idea to do that the day before the race instead. I woke up in the middle of the night before the race with my foot hurting. I'm not sure how I did it, but I got a cut under my little toe on my right foot and it was painful. I was panicking wondering if I should go to the 24 hour Walgreens for a liquid bandaid, but I ended up running through it. Boy did it hurt for days after the race though! I ended up walking for 4 hours on Friday because I thought it would be nice to walk to the Expo from my hotel on the Magnificent Mile, but then I couldn't find the shuttle to take me back. Whoops! I'm probably the only person at the Balboa Tent who wanted a photo with race director Carey Pinkowski, but was too afraid to ask. As a marathon race director myself, I really admire the job he does! I was happy with my race performance for about 24 hours before the negative thoughts started creeping in. I wish I could be satisfied and content with achieving my goals instead of second guessing and criticizing myself for shortcomings. This is something I'm working on, but it's hard to not expect more from myself. When I finished the race I told myself I would never run another marathon until April 2017 when hopefully my twin will be running her first Boston Marathon and I just might be running my last. I really want Malinda to qualify this fall and for both our times to be good enough to get into the race. I've dreamed of running Boston with my sister since 2013 and want it to become reality. Well, I didn't run a negative split, butI was just 2 minutes slower in the second half whereas in previous years I was 3-4 minutes or more! My splits, from fastest to slowest. Yeah, my last 10K was my slowest! The last photo of me with LONG hair. Deena Kastor broke the American Master's marathon record!